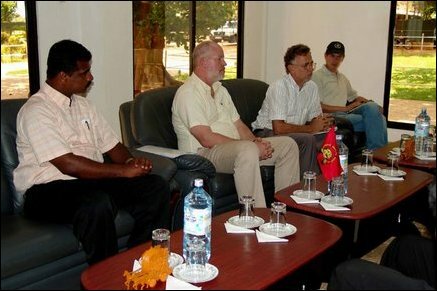 Executive Director of Rome Head quarters of World Food Program (WFP) met with a delegation of Liberation Tigers led by Head of LTTE Political Wing, S P Thamilchelvan, at the LTTE Peace Secretariat Monday morning, sources in Kilinochchi said. 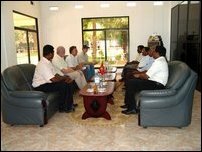 Deputy Head of the LTTE Political Wing, S Thangan, LTTE Liason officer for the NGOs, M Thiyagarajah and Director of LTTE Peace Secretariat, Puleedevan, participated in the discussions. The talks centered on the currently active programs and the planned WFP programs in NorthEast. The WFP Executive director expressed his appreciation for the cooperation given by the LTTE to the WFP to execute its projects in the NorthEast and described WFP's plans to provide nutritional food to pregnant mothers and children under five years old. The WFP officials also obtained information on efforts taken by the LTTE related to the stalled peace process.